An eggah is a flat type of Arab egg cake, generally more substantial than a frittata. As well as making a great supper, it’s also perfect for outdoor feasting or taking on a picnic. 1 Preheat oven to 180°C (350°F). Break eggs into a large bowl and beat lightly with a fork. Add spinach, spring onions, parsley, mint, lemon zest and ½ a teaspoon of salt and plenty of black pepper. 2 Butter a deep 20cm (8”) diameter cake tin with a little melted butter and line the bottom with baking (parchment) paper. 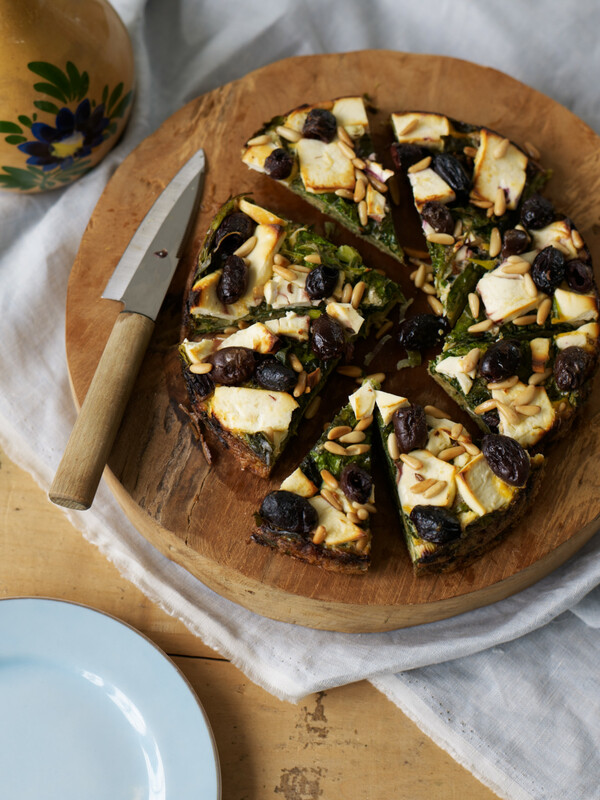 Pour in egg mixture, then scatter with feta, olives and pine nuts. Drizzle with remaining melted butter. 3 Bake eggah for about 40 minutes. If the top starts to brown too quickly, drape a piece of tin foil over the top. The vegetables should be tender and the egg set with a crust at the bottom and the top should be lightly golden. Remove from tin by inverting onto a plate, peeling off paper then quickly inverting it onto a serving plate. Serve at room temperature. This seems like something you could do in a (well-seasoned) cast-iron skillet, starting the baking process on the stove and then transferring to the oven when you start to get some separation (at the edges). No parchment needed in that case. Absolutely René! I think it would work brilliantly. Let me know how you get on. It worked out great indeed, even with thawed frozen spinach and local nuts instead of pine nuts. I’d upload a few pictures but it appears that’s not possible here. Getting the walls of the skillet hot enough to prevent some sticking remains tricky though. Oh, and the eggah is indeed much better when cooled off (or after having spent a night in the fridge in an airtight container). That sounds great! Good to remember if the oven goes bung! Scones, rhyming with 'on' or scones, rhyming with 'own' ... doesn't matter which way, they're scrumptious!